Mrs. Hufnagel is visited by friend and amateur magician Murray Robbin, who loses his dove. Murray Robbin's (Murray Rubin) sort-of-magic trick. In "The Children's Hour", the twelfth episode of the third season of St. Elsewhere, Mrs. Hufnagel (Florence Halop) gets the most screen time of any of her appearances to date. She pops up in an early scene, when she wheels up to the door of a room where a woman can be heard screaming and implores Nurse Helen Rosenthal (Christina Pickles) to give the woman something for the pain. Later, she is in her room when former patient and friend Murray Robbin (Murray Rubin) drops in for a visit. In addition to his singing and comedy, Murray is also a budding magician, and for one of his tricks, he produces a dove from his coat pocket. 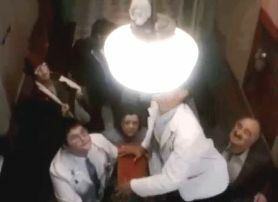 When Dr. Elliott Axelrod (Stephen Furst) arrives and scolds Mrs. Hufnagel for bringing a live pet into the hospital, the bird escapes during Elliott's attempt to confiscate it. Orderly Luther Hawkins (Eric Laneuville) manages to capture the bird in hand from atop a light fixture, much to the delight of Florence and Murray, who actually manages to get a laugh from her with a joke. Later, Axelrod discharges Hufnagel whose treatment for phlebitis ("I don't know what Nixon was complaining about") has ended, but his relief at her departure is snuffed out when she informs him that she'll be back to visit Murray, who is about to be re-admitted for his colitis. Luther (Eric Laneuville) rescues Murray's dove. The other story, alluded to here, involves the woman who was screaming in the first scene. Mrs. Dowd (Anne-Marie Martin) is the attractive, nymphomaniac wife of a patient who begs Dr. Victor Ehrlich (Ed Begley, Jr.) to figure out a way she can have her needs satisfied while her husband is admitted to St. Eligius. Ehrlich turns to Luther for a solution, but is shocked to learn that couple is using Dr. Craig's office while he's at a conference. Ehrlich hides his face and retreats hastily when he spots Hufnagel approaching.